There are countless examples of popular gold coin programs available today from mints around the globe. 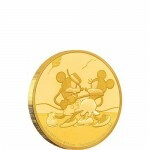 Among the most popular with collectors are Gold Disney Coins. Struck at the moment by only two mints globally, Gold Disney Coins feature impressive purity, beautiful designs, and low mintage figures that make them the perfect addition to any personal collection. Two major mints in the global market have chosen to focus on the prominence of Disney. Founded on the back of a single mouse and the vision of Walt Disney and his brother Roy, the Disney Corporation is one of the largest and most profitable businesses in the world today. Its variety of products and characters range from the lovable couple of Mickey and Minnie Mouse, to its theme parks of Disneyland in California, and the massive Disney World facility in Orlando, Florida. It was only a matter of time before these beloved characters who have dominated popular culture for more than 80 years came to the precious metals industry. Gold Disney Coins are available in a variety of different sets. For example, the New Zealand Mint has a portfolio of options ranging from the Disney Princesses collection to the Disney Classics collection. The latter of these two collections features an exciting coin set that any serious Mickey Mouse fan has to own. The Disney Classics collection contains a sub-category of coins known as Mickey Through the Ages, which follows the evolution of Mickey Mouse throughout the course of nearly 90 years of feature films and animated shorts. More recently, the Monnaie de Paris, has jumped into the market with its own collection of Gold Disney Coins. The variety of designs from both mints makes it possible to find the perfect Disney coin and add to your growing Gold Disney Coin collection today! From there, Mickey Mouse has exploded into a global cultural icon that is recognized easily by children and adults around the globe. The Mickey Through the Ages collection from the New Zealand Mint chronicles the maturation and appearances of Mickey Mouse over the course of his early animated shorts and, eventually, more recent films. 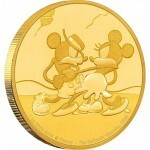 The following paragraphs explore the Niue Gold Coins from the Mickey Through the Ages collection currently available from Silver.com, and feature in order of release. Ships encapsulated in a colorized, printed card with. Additionally, the coins in this collection share a common obverse design. On the obverse of each Gold Disney Coin is the image of Queen Elizabeth II. Her Majesty’s right-profile portrait was created by Ian Rank-Broadley in 1998, and serves as the official obverse design for the majority of commonwealth coins. The official sovereign mint of France, the Monnaie de Paris (or Paris Mint), has recently introduced its own Mickey Through the Ages collection of coins. Featuring silver and gold options, this new series is enticing for collectors on the European continent. These coins are available in gold with three weights, including ¼ oz, 1 oz, and 5 oz. Part of the Mickey Mouse Through the Ages release. Limited mintage of only 1,000 coins. Contains ¼ Troy oz of actual gold content. Bears a face value of €50 (Euros) backed by the French government. Reverse features a common design theme for the series. Obverse depicts Mickey in Mickey’s Nightmare. From the Mickey Mouse Through the Ages program. Contains 1 Troy oz of .999 pure gold. Issued a face value of €200 (Euros) by the French. Obverse features Mickey from Steamboat Willie. Reverse includes the common Mickey Mouse design. Ships in an individual plastic flip. From Mickey Through the Ages release. Limited mintage of only 99 coins. Contains 5 Troy oz of .999 pure gold. Face value of €500 (Euros) is fully backed by France’s government. Reverse features the common Mickey Mouse portrait in the series. Obverse depicts Mickey Mouse from Plane Crazy. Design features for each of the releases in this collection are slightly different on the obverse field, paying homage to Mickey Mouse in their own special way. All of the coins in the series feature the same reverse design, that of the iconic right-profile portrait of Mickey Mouse is captured in brilliant gold relief, with engravings of the face value, year of issue, and Mickey’s name. 2016 ¼ oz Proof Gold Mickey Coin: The obverse of the 2016 ¼ oz Proof French Gold Mickey Mouse Through the Ages Coin is the image of Mickey as he walks along in the animated short film Mickey’s Nightmare. The designs include the use of an engraving, in French, that identifies the coin collection’s name. 2016 1 oz Proof Gold Mickey Coin: The obverse of the Proof French Gold Mickey Mouse Through the Ages Coin features the lovable Mickey character from Steamboat Willie. There is an engraving in French on this side that identifies the name of the collection. 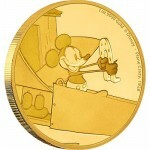 2016 5 oz Proof Gold Mickey Coin: On the obverse of the Proof French Gold Mickey Mouse Through the Ages coin is the image of a quizzical Mickey Mouse, as first seen in Plane Crazy. The film didn’t test well originally because it was a silent film, but when it was re-released in 1929 in sound it took off. When you purchase Gold Disney Coins on Silver.com, you’ll find a number of payment methods available to complete your transaction. We accept Visa and MasterCard credit and debit cards, as well as paper checks, Pay Pal transfers, and bank wire transfers. Credit and debit cards have a maximum purchase of $5,000 and generally take one business day to process. 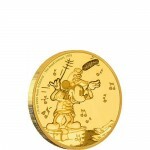 If you have any further questions about Gold Disney Coins, please don’t hesitate to ask Silver.com. Our associates are available on the phone at 888-989-7223, or you can connect with us online using our live web chat and email features.